A reader of my last post needed a simpler slipper pattern that did not require double-pointed needles, knitting in the round or a lot of increasing or decreasing of stitches. So I found the original pattern from my grandmother and made it into a pdf for you to save for yourself. These are the slippers that my grandmother and my aunt made for many, many years. I remember my mom was collecting clothing for a rummage sale and someone donated a hand knit wool dress. It was purple with hot pink, grey, and white stripes and easy to see why it had been donated. My grandmother ripped the dress apart and saved the yarn. I have no idea how many of these slippers she and my aunt made with this yarn but we received some variation of purple slippers for years and years and years. This is not an original design and you can do a search to find many variations on this pattern. The pattern is easy and knitted flat. It’s a great beginner pattern for someone learning how to knit and purl. There are two decrease rows. Two seams are sewn for each slipper. The end result is almost the same as the seamless slipper but the heel part is a bit wonky as it isn’t shaped quite the same. Here’s a photo of the bottom and back seam. Once on the foot, the sole evens out and fits fine. It just looks weird at first. Have fun and let me know if you make these. The pattern is listed on the “My Designs” tab at the top of this post as a pdf pattern. 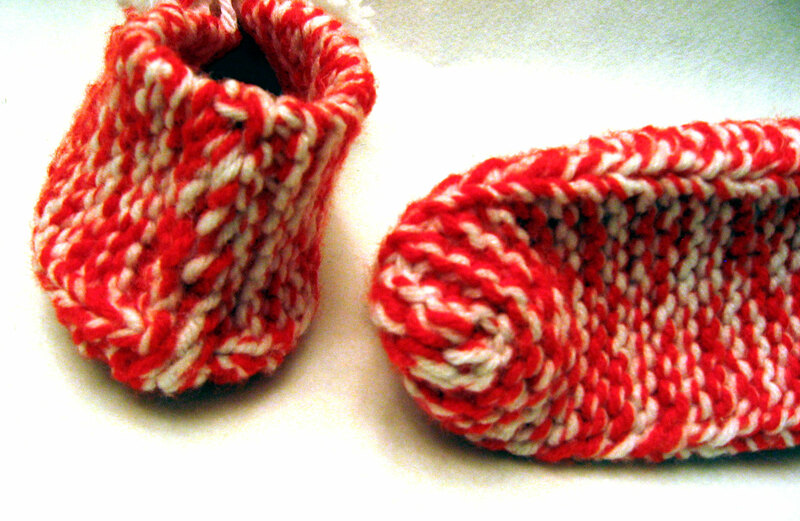 This entry was posted in knitting, knitting pattern, pattern, TUTORIAL and tagged Free pattern, knitting, pattern, slippers by Patti_is_knittinginflashes. Bookmark the permalink. Thanks so much for taking the time to post this. I really appreciate it and look forward to trying them!